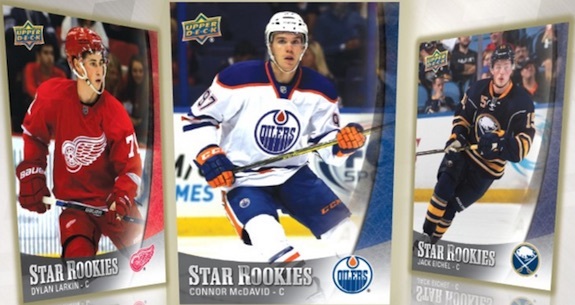 Capitalizing on the stacked rookie class, the 2015-16 Upper Deck NHL Star Rookies Box Set takes a detailed look at some of the top players to make their league debut in the 15-16 season. In addition to the base options, collectors can also find limited autographs. Featuring 25 young studs, the factory set covers some of the biggest rookie names, including Connor McDavid, Jack Eichel, Dylan Larkin, Nikolaj Ehlers and Artemi Panarin. Each box set includes all 25 rookie players. Although there are no inserts in the release, Autograph parallels of the base set add a sticker signature for many of the subjects. They are no easy pull, however, averaging one per case (1:20 boxes). 25 cards. Shop for base cards on eBay. Great option for people who can’t afford the high priced products. I will certainly buy one. 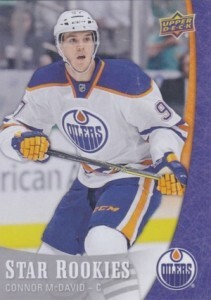 2015-16 Upper Deck NHL Star Rookies Box Set New Factory Sealed Connor McDavid!